Like the majority of people around the world in January, I’ve thrown off the devil’s horns and dusted off that halo. And to make it shine, I have vowed to do more of two things this year: write and move. So the #writeandrun31 challenge put out by Christine Frazier (who deconstructs bestselling books at the Better Novel Project) and her brother Matt Frazier (a vegan ultra-marathoner and author of No Meat Athlete: Run on Plants and Discover Your Fittest, Fastest, Happiest Self) felt tailor-made for me. Basically, for 31 days, starting whenever, you devote some time every day for 31 days to writing (or any creative work) and running (or any form of fitness). The idea is to start small and that the two activities should reinforce each other. Hope I haven’t set myself up for failure with this list. Anyway. Yesterday, day one, was good. Ticks all round… apart from the breathing. Today was day two of 31. I got my writing task done this morning, but was procrastinating on the walk part (baby steps) of #writeandrun31 all of the dull day. Finally decided to just get out to the Sea Point Promenade, my favourite place in Cape Town, this stunning city at the bottom of Africa. But I headed to the Prom anyway, and was glad I did: It wasn’t raining that side of the mountain. As I began walking, I looked at the public artworks that have caused such controversy, with many ardent articles written on them in recent months, and agreed that between the seal-shaped benches, the Ray Ban sunglasses sculpture and the like, the Prom is beginning to look like the bottom of a giant’s abandoned toybox. As I moved, I wondered on the link between motion and memory and metaphor. I saw boys and girls in their Shabbat best. I saw a man with jeans caked in grit, inhaling glue from a plastic bread bag, dancing dangerously close to the railing’s edge in his inebriated bubble. Where will his story end? I felt blessed when I came to the photography exhibition plastered on the concrete Promenade wall. Called “Sea Change”, the term first coined by Shakespeare in The Tempest, the multimedia project looks at man’s transformative relationship with the sea and its kelp forests and aquatic creatures, starting with the first (wo)man. And in just several steps, I went from feeling glum to being in my head to noticing others to going way back in time to where the human story started. 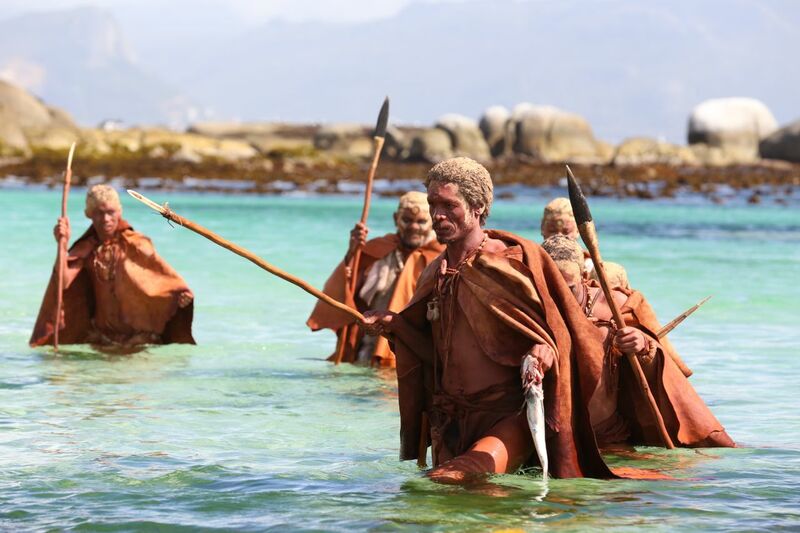 Early hunter-gatherers relied on the sea. One of the photograph’s captions spoke of divers finding their “sea eyes”, and seeing creatures they’d never spotted before with regular diving. I guess with this challenge, I am hoping that repetition and paying conscious attention to movement and writing will help me strengthen my writer’s eye. As I was leaving, the sun burnt through the clouds. And the day felt that little bit brighter. Click here for more on the Sea-Change project and their support for MPAs (Marine Protected Areas). 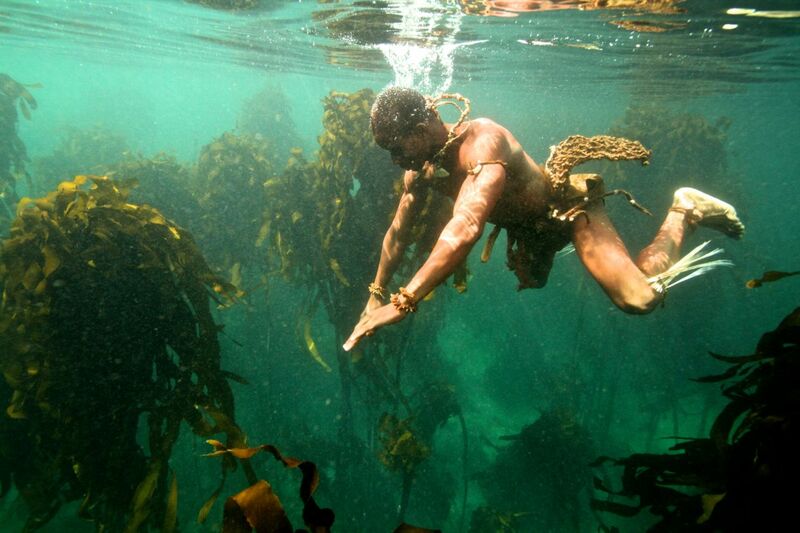 Navigating the rich kelp forests.